Results of the Officer and Delegate elections for AFT Local 1904, for the term of May 17, 2012 through April 30, 2014, are listed below. Complete vote tallies are available on the Local 1904 website. We congratulate the officers and delegates elected, both those newly elected and those continuing in office, and trust they will do their best in representing our members, locally at Montclair State University and with the State, in these difficult times. Rich Wolfson's Letter to the Editor about cuts to higher education and NJTV's unbalanced coverage of our Day of Action on April 25th ran in The Clifton Journal today. After several weeks and negotiations sessions, an agreement was reached with the MSU administration regarding the work schedule for this summer. Please click here to read it. There is also Table Talk associated with this agreement. Both of these documents can be found on our Contracts tab as well. A number of members expressed their concerns over the new time the university wants us to work during the summer. Please know that the MSU administration recognizes that there are circumstances that might make working an 8:00 a.m. to 5:30 p.m. schedule difficult, and the Table Talk associated with this agreement may be helpful to you. If you have questions about requesting a modified schedule, please email Lisa Ambrose at: lisa.ambrose@aftlocal1904.org. In response to the unbalanced coverage on NJTV about our Day of Action on April 25th, Rich Wolfson, President of AFT Local 1904, sent letters to the editors of a number of media outlets. The Home News Tribune ran the letter on May 10th. Click here to read the letter. AFT Local 1904 announced the recipients of the 2012 Becker-Keenen-Moore-Uhia-Waller Scholarship at its May 2, 2012 General Union Meeting. 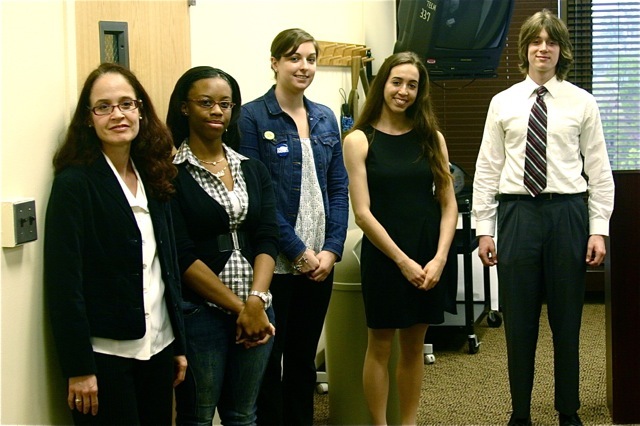 L-to-R: Maria Skolyszewski, Qualicia Quiles, Samantha Spencer, Kelly Vaghenas, & Robert Barrows. Robert Barrows, Qualicia Quiles, Samantha Spencer, and Kelly Vaghenas are recipients of the BKMUW Scholarship and Maria Skolyszewski is the recipient of the Ellen Kerns Nunn Scholarship. The Local extends its thanks to the Scholarship Committee members for their hard work and thoughtful consideration of the applicants. The committee members are: Carmen E. Reyes-Cuevas, Mei Ling Chow, Susan Hagen, John J. Gaynor, Louise Davies, Jonida Dervishi, Andrew Maxwell, and Jeffrey Schonfeld.